A fear of being or going insane: Those who suffer from dementophobia are afraid that they are losing contact with reality, members of their families, or friends. Another reason someone might have dementophobia is because he or she has severe depressions, headaches, dizziness, or difficulty breathing. 1. A quality or characteristic deserving of blame or censure; a fault. 2. Absence of merit; the quality of being inadequate or falling short of perfection. 3. A mark made against a person's record for a fault or for misconduct: The soldier received a demerit for his failure to do his assignment as ordered. 1. To remove minerals or mineral salts from something; such as, bone or a liquid. 2. 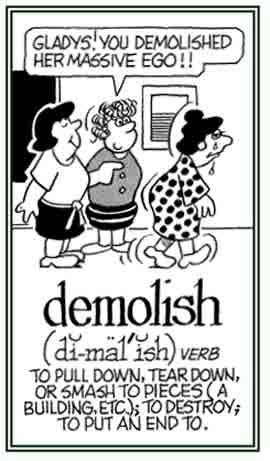 To lose mineral content or to become demineralized. 1. Death; the end of existence or activity; a termination: Tom's town has not had any local news coverage since the local newspaper's demise last year. 2. In law, the transfer of an estate by lease or will: James, the landlord, demised his property to his son, including his control over it. 3. The transfer of a ruler's authority by death or abdication: The crown was demised to the queen's heir, the prince, after she died. 4. 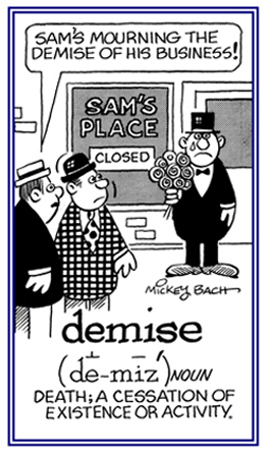 Etymology: from about 1442, from Middle French (c.1400 to c.1600) demise, past participle of demettre, "to dismiss, to put away"; from des-, "away" (from Latin dis-) + Middle French mettre "to put"; from Latin mittere "to let go, to send". 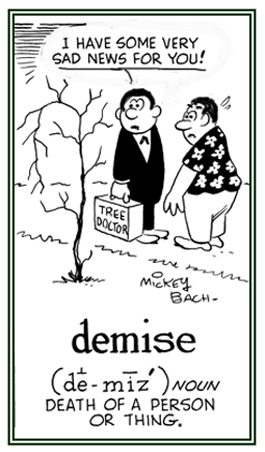 It originally meant "the transfer of an estate by [means of a] will"; and the meaning was extended in 1754 to "death" because that's when the transfer happened. Here is a change in common usage that offers a linguistic clue to a cultural change which has resulted from electronic mail (e-mail) usage. This presentation is about the threatened abandonment of the symbolic embrace inherent in an old Teutonic word: Dear! The application of "Dear" came into existence about a thousand years ago meaning "honorable, worthy", and then it took on the sense of "esteemed, valued" and ultimately "beloved", gaining a sense of "high-priced" along the way. Back in the time of the "quill pen", the word was used as a polite form of address in introducing a message to a friend or to a stranger and establishing status to a superior, an employee, or an equal. 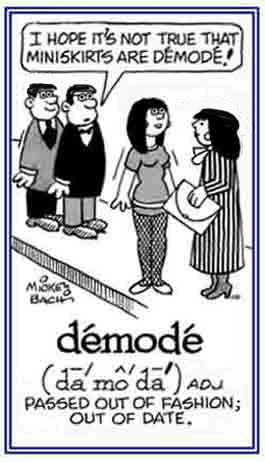 Now, in the age of instant messaging and e-mail, the compressors of personal communication have been doing away with the word traditionally used in salutation. Instead of using Dear, the e-generation often starts off either with no greeting, the first name, Hello Name, Hi Name, etc. Apparently, the internet is now considered to be an informal means of communication and so it is no longer necessary to use a particular form of greeting; as long as it isn't replaced with some form of rudeness. as seen in the International Herald Tribune, October 23, 2006; page 7. 1. Pertaining to something that is old-fashioned or no longer in style: Eve was wearing a démodé dress that her grandmother gave her which she wore in her youthful days. 2. 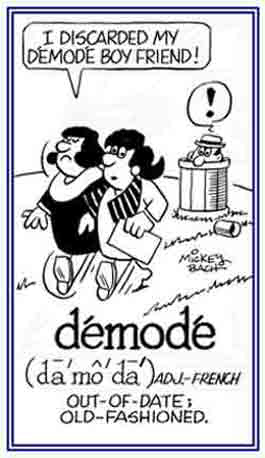 Etymology: from French, the past participle of demoder, "to outmode" from dé-, "out" + mode, "fashion". © ALL rights are reserved. A way to logically prove something: Editors of publications usually have demonstrabilities which can provide good reasons for revising the contents of some written documents. The quality of being provable or logically validated: The employees were shown the demonstrableness of the new manufacturing process. The new administrator revealed the demonstrableness regarding the lack of concern that the previous administrator had for his staff. Clearly evident, or obvious: The politicians had a demonstrably lack of concern for the general welfare of their country. Showing page 26 out of 44 pages of 646 main-word entries or main-word-entry groups.